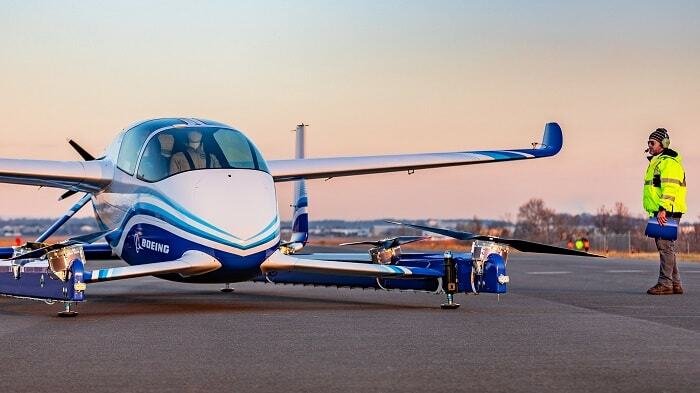 The American airplane manufacturer Boeing announced the successful completed first flight of its autonomous passenger air vehicle (PAV) prototype. This first test flight, realized in Manassas, Virginia, USA, demonstrates the company’s urban air mobility efforts. With the support of Boeing subsidiary Aurora Flight Sciences, Boeing NeXt, responsible for urban air mobility, designs and develops the electric aircraft which is able to autonomously take off and land (eVTOL) vertical. Further tests will be conducted in the next time in order to improve safety and reliability. This flight project is still at the beginning. During the first test flight on 22 Jan 2019, the vehicle’s autonomous functions and ground control systems were tested during takeoff, hover and landing. The most challenging flight phase of the high-speed VTOL aircraft, the transition between vertical and forward-flight, has not been tested yet. This challenging task is planned for future flight tests. Driven by an electric propulsion system, this oversized drone is planned to completely fly autonomously. It is able to fly about 80 kilometers (50 miles). From building air vehicles to airspace integration, we will usher in a future of safe, low-stress mobility in cities and regions around the world. Indeed, Boeing is not the first presenting a manned drone. Two years ago, EHang 184 impressed the world with a marketing-effective test flight in Dubai (UAE).